Address: 224 S 1300 E, SLC, UT 84102. 801.581.0888.
Review: The wife was preparing to perform in "L'incoronazione di Poppea" (The U's spring opera), so I had a bit of time to kill. And what better way to kill time than to find a new place to eat? There is none, of course. With this in mind, I meandered to Aristo's, a Greek restaurant near other venerable joints like Indochine and B&D Burgers. 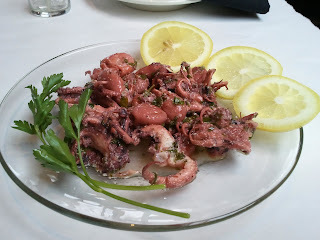 I began the meal with oxtapodi toursi, which is baby octopus marinated in olive oil, red wine vinegar, and spices, and served with lemon and parsley. Having grown up in Alaska I dig me some octopus. These little guys had a nice taste. The red wine vinegar and lemon gave a nice kick to the mild meat. The parsley and spices rounded out the flavor nicely. The octopuses themselves were a bit dense and slightly grainy in texture. (Okay, I know some of you just said to yourselves, "It's octopi, you misguided soul." Well, octopi is acceptable, as is octopuses, which is more common. Octopodi is even used, but really only in British English.) I imagine this is because we live in Salt Lake and not on the Greek coast; but, in any case, the non-freshness detracted from the overall quality of the dish. That said, I'll probably order it again. Next up was the gyro. Yeah, I know, Greek restaurant and all those options and I picked the gyro. Well, they're good, man. Don't fix what ain't broke. This was a standard gyro: sliced beef/lamb combo meat heavily spiced with oregano and other goodies, tomatoes, red onion, tzatziki (yogurt and cucumber) sauce, all on a pita. First, the pita. Light, slightly spongy, luscious flavor, very nice. The meat was well spiced and tasty, although it seems gyro meat is invariably dry since you're only served the crispy outside of that meat club looking thing. 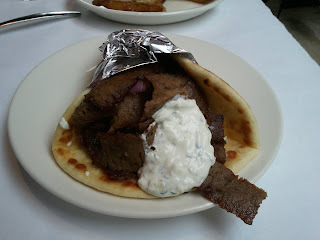 The tomato, onion, and tzatziki all act to lighten the gyro and give it a little acidic bite. Good, good stuff. And lastly, Aristo's oven-roasted potatoes deserve mention. I'm still slightly torn about these. 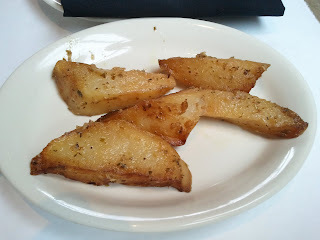 Spiced with oregano, oil, and vinegar, these were possible the most moist oven-roasted potatoes I've experienced. And they had some big flavor. On the other hand, the addition of liquid at the end of the cooking process negated any crispiness these potatoes once enjoyed. In the end, I think the trade off was worth it. In all, Aristo's is a quality place. I'm looking forward to going back and trying some of the more exotic, if you will, dishes. Rating: 7/10 (5/10 is average). Copyright Marco Brown 2011. Picture Window theme. Powered by Blogger.